Comic Book Resources has an interview with Dean Mullaney and Kurtis Findlay, who have edited Chuck Jones: The Dream that Never Was, a collection of the comic strip Crawford that Jones did in the late 1970s. The book will be available in December. I remember reading the strip and clipped a few of them before I lost interest. One of the ironies of Jones' career is that he received more attention and opportunity when his work was in decline than he did when he was at his peak. 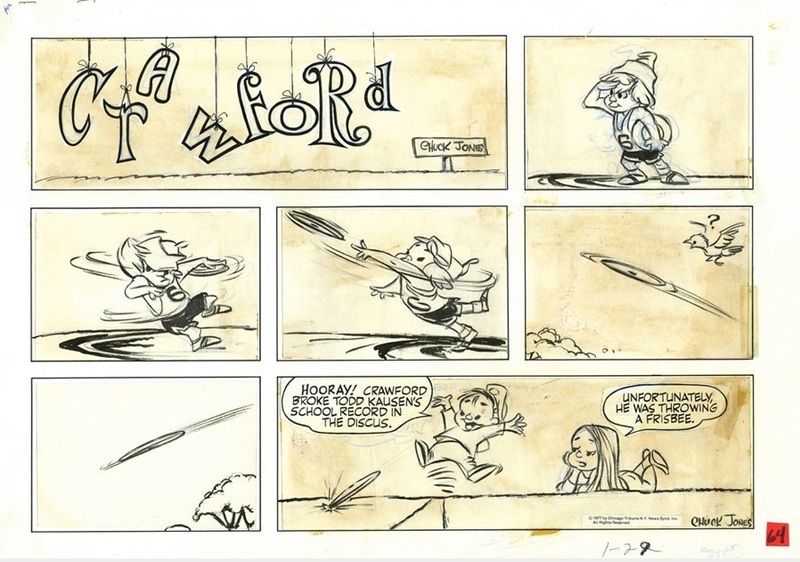 Crawford suffers from the cuteness that infected much of his post-Warner Bros. work and the coarsening of his drawing that also occurred then. 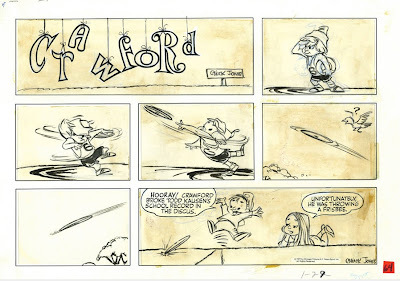 I will definitely look this book over when it is published for the opportunity to see unpublished work and to compare my current impression with my memories of the strip, but I don't believe that Crawford is a hidden treasure that will add anything to Jones' reputation. This is not Peanuts or Calvin and Hobbes. If it was, the strip never would have been cancelled and would be better known today. "but I don't believe that Crawford is a hidden treasure that will add anything to Jones' reputation. This is not Peanuts or Calvin and Hobbes. If it was, the strip never would have been cancelled and would be better known today"
I don't necessarily believe that because a strip has been canceled and/or is relatively unknown as of today that's it's automatically bad, given the host of bad strips that were/are not cancelled and are well known (Garfield, anyone). Not to mention the number of good strips that are really known only to newspaper comic fans and people who lived at the time of the strips publication (Pogo, Thimble Theatre under Segar, Wash Tubbs). Still, I will agree with you, Mark, that this strip probably is not going to show Jones's talents in a good light. This book may be the best argument yet for how heavily Jones relied on his storymen. Ideas didn't come naturally to Jones, and there's nothing wrong with that, but it's an important consideration when discussing him in context of other Golden Age directors, like Tex Avery.